This seemed like a great opportunity to try out one or two green tomato recipes. 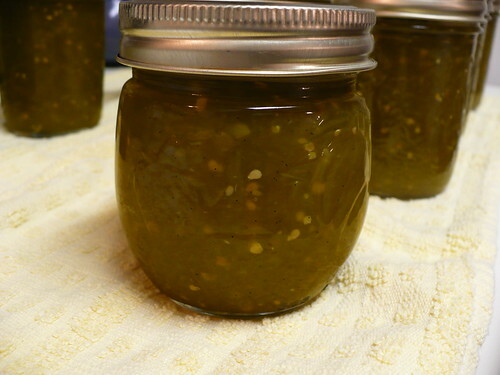 I narrowed my search for recipes down to two options – green tomato pickles and green tomato jam. 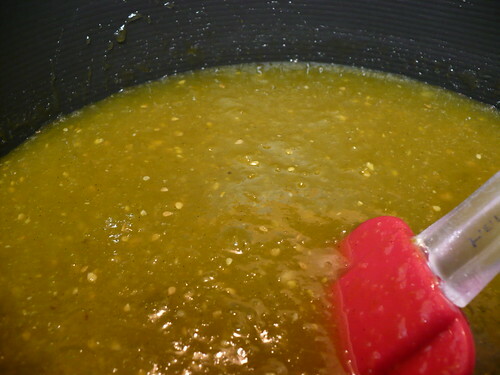 After some discussion, I settled on a batch of green tomato jam, specifically Green Tomato Jam with Ginger and Vanilla Bean. Here’s what the jam looked like near the end of the cooking process. We did end up using the immersion blender to get rid of the worst of the chunks and tomato skin, since I felt that peeling small, green tomatoes was not worth my time. The jam seems to be a little bit too sweet for my taste. If I made it again, I’d be tempted to reduce the amount of sugar. There’s the final product after the water-bath canning process. If you don’t like the seeds, you can always take the seeds out before cooking the jam. From this small picture, you can’t see the tiny specks of vanilla bean, but it kind of lends a gourmet feel to the jam. Then the question became, what to do with the remaining, semi-anemic tomatoes? Oh yeah, and I also have some kale from cleaning up the garden. And some ground lamb kicking around the freezer. And some semi-ratty looking carrots in the refrigerator. Soup it is! 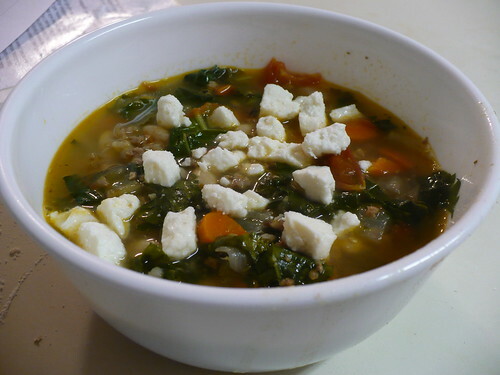 Specifically, I ended up making Lamb, White Bean, and Kale Soup, which happened to use tomatoes and carrots as well. You can kinda see what I mean about the anemic-looking tomatoes, can’t you? 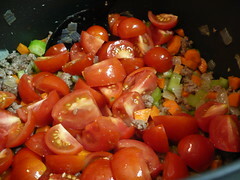 But hey, cook them down with some ground lamb, onion, carrot, celery, and spices, and you’re good to go! Of course, the kale goes into the soup right at the end, so that it doesn’t get cooked into oblivion. The recipe also calls for a garnish of feta cheese on top, which really tops off the yum factor! Posted on November 9, 2010, in Harvesting & Eating and tagged Tomatoes. Bookmark the permalink. Leave a comment.